Baby steps: NEW original album! It’s on! 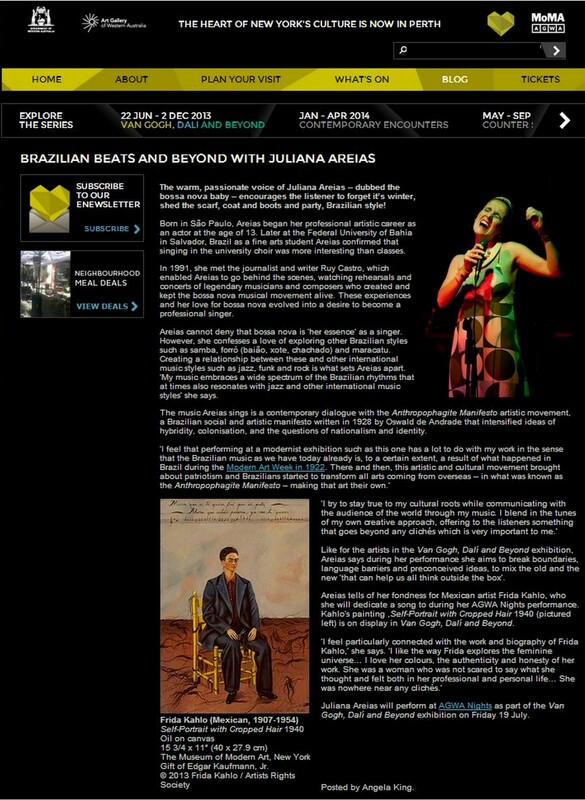 The crowd-sourcing campaign to raise funds for the production of Juliana Areias’ first original album, “BOSSA NOVA BABY”. The heart of New Your’s Culture is now in Perth. This visually stunning exhibition presents 134 masterworks by 96 of the world’s greatest artists. Re-imagining the world around them, these artists invented new strategies that shaped modern art. This exhibition presents three of the most fundamental artistic genres which link and transcend the ‘isms’ of twentieth century art, from Impressionism, Cubism, Surrealism and beyond to the art of today. This outstanding collection of paintings, sculptures, drawings, photographs, prints, and media works from the collection of The Museum of Modern Art, New York spans over 120 years and presents the timeless subjects of landscape, still life, and portraiture with renewed urgency and vitality. Works by eminent artists such as van Gogh, Picasso, Cézanne, Toulouse-Lautrec, Klimt, Dalí, Kahlo, Wesselmann, Koons, and Richter allow you to experience some of the most innovative interpretations of traditional genres, and discover a renewed sense of wonder at what the world can be. Many of the most important artists of the 20th century will be represented, with works that reinvented Landscape, Still Life and Portraiture in their time. 1) How will performing as part of the Van Gogh, Dali and Beyond exhibition shape your performance? I feel that performing at a modernist exhibition such as this one has a lot to do with my work in the sense that the Brazilian music as we have today already is, to a certain extent, a result of what happened in Brazil during the Modern Art Week in 1922. 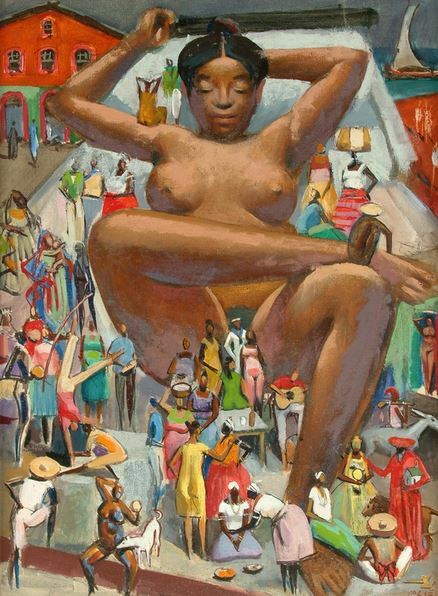 There and then, this artistic and cultural movement brought about patriotism and Brazilians started to transform all arts coming from overseas – in what was known as the “Anthropophagite Manifesto”– making that art their own. The music that I do today is a contemporary dialogue with that artistic movement. My music has been influenced by various musicians and composers from Brazil and overseas where I have lived since the age of 21. I try to stay true to my cultural roots while communicating with the audience of the world through my music, so I blend in the tunes my own creative approach offering to the listeners something that goes beyond any clichés which is very important to me. Like for the artists in this exhibition, I aim with my performances to break boundaries, language barriers and preconceived ideas, mixing the old and the new, the simplicity and the sophistication that can help us all think outside the box. 2) Do you have a favourite artist from the Van Gogh, Dali and Beyond exhibition? What can the AGWA audience expect from your performance? 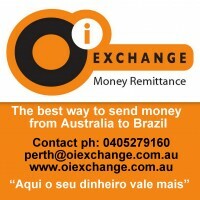 I will be there with all my heart to blend classic and contemporary bossa and samba. I love the spontaneity and flair with which Mark Shanahan, Adam Springuetti and Chris Tarr improvise and I cannot wait to enjoy the company of their sassy music notes. My music embraces a wide spectrum of the Brazilian rhythms that at times also resonates with jazz and other international music styles. 4) What has the last 12 months been like for your band? 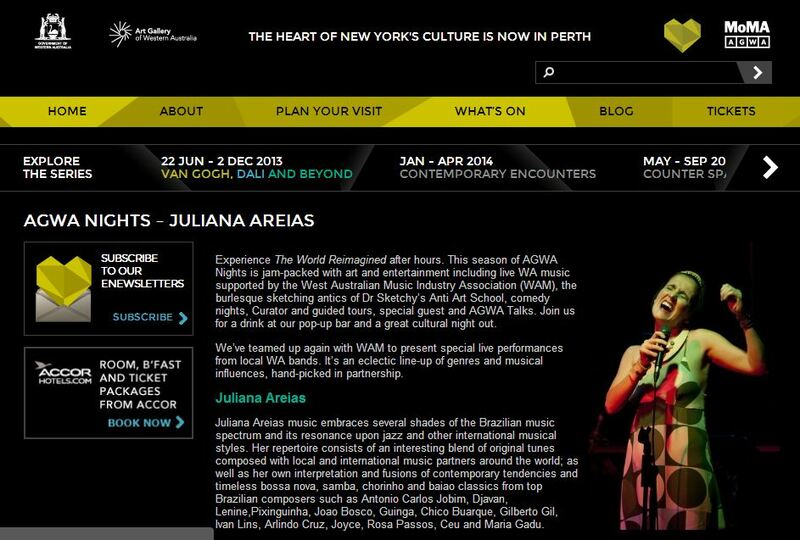 A very inspiring and busy year of work, creation and collaboration with some of best jazz musicians in Australia, such as the virtuoso Melbourne guitarist Doug de Vries, Perth’s dearest pianist Tal Cohen, musicians from the Cirque du Soleil, performing at concerts all around WA, Australia and overseas as well, during summer having more then 20 performances per month. 5) Can you tell us a bit about your style of music? As the Brazilian journalist and writer Ruy Castro would agree when he nicknamed me as “the bossa nova baby”, I cannot deny that bossa nova is my essence as a singer. I must confess that even if through the “bossa nova” lenses, I do love exploring other Brazilian styles – such as samba, forro (baiao, xote, chachado), maracatu – and creating a relation between them and other international music styles such as jazz, funk and rock. 6) What is the best gallery or exhibition you have ever visited? This is a hard question. 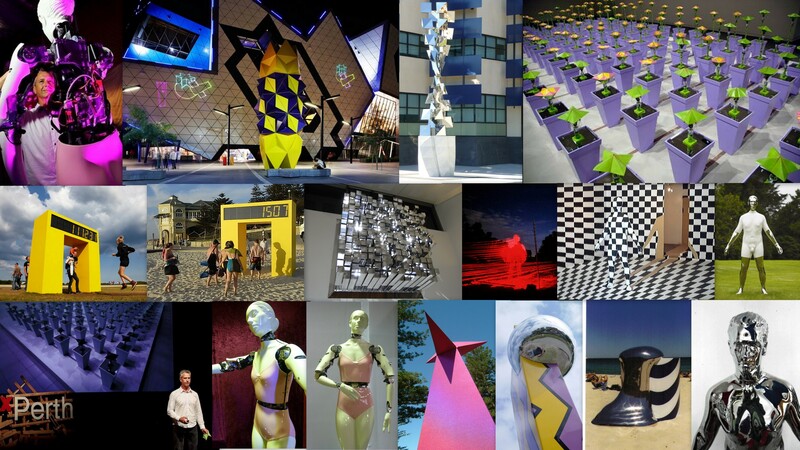 I have been to quite a few galleries and exhibitions in South America, Europe and a few here in Australia. I would even go further and say that I really like street art or “the gallery outside the gallery”. When I used to live in Geneva in Switzerland in the late 90’s, I used to go to Paris quite regularly, it was then that I visited the “Espace Dali” not only did I enjoy the art collection but also – and mainly – loved being in Montmartre. 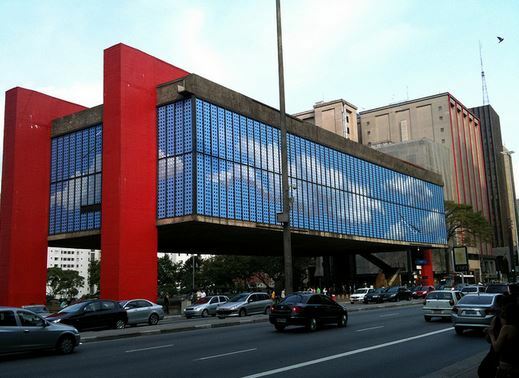 A museum that has always been very dear to me and that I used to visit quite regularly was MASP (Museu de Arte de Sao Paulo). MASP is internationally recognised for its collection of European art, considered the finest in Latin America and all Southern Hemisphere. This is a place that makes me really proud of the city where I was born, Sao Paulo, MASP is right in the heart of the city, on Paulista Avenue (Avenida Paulista). It is a pulsing vein of the Brazilian metropolis and not only it exhibits art but also political engagement, acting involuntarily as a stage for public demonstrations, debates and sometimes even concerts. 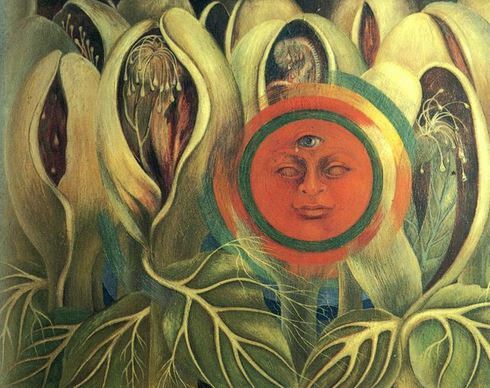 In Brazil, one of my favorite artist is Carybe from Bahia (actually, he was born in Buenos Aires but he is also Brazilian). 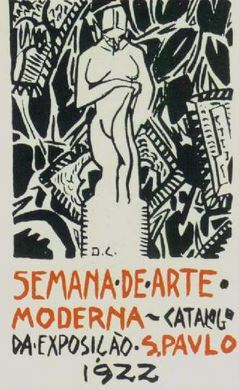 He was one of the pioneers at the Modern Art in Bahia. 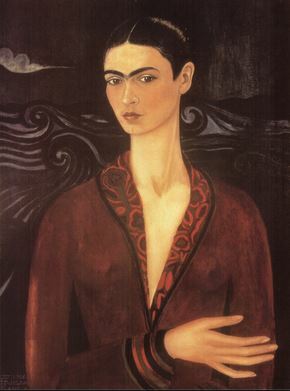 I fell in love with his work because I lived in Bahia for four years. His work can be found at various public places in Salvador. Here in Perth, I have been particularly fascinated by the Coppelia Project of Australian artist Geoffrey Drake-Brockman whose work, in broad terms, links science and art. This is something that interests me in a world where our perception is constantly being influenced by the inevitable technological platforms. As a performer and ‘samba de gafieira dance’ lover, I can’t wait to see how robot ballerinas will sync their steps with human ones on stage. Worth watching the Artist’s TEDx Talk for background and context of his work. 7) What do you do when you’re not playing music? The mind is always working and creating. Even when I’m not performing, rehearsing, composing; I am always involved with other aspects of music production. I pretty much manage my career on my own, so I also have to keep up with website updates, promotion, sponsors, video productions. 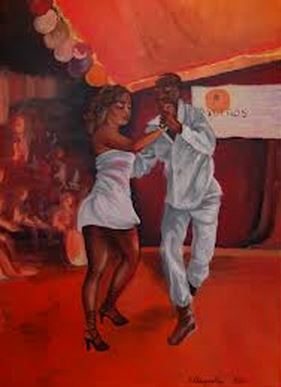 I also dedicate time to other passions such as learning and practicing Samba de gafieira Dance – the Brazilian answer to Tango; it is a very elegant and lively form of dance for couples. I also spend time supporting culture related business, associations and similar cross-cultural initiatives. And of course, I love to enjoy time and get inspired by my kids, family, friends, people, the sea, the nature and all forms of art in general. 8) Which other musicians inspire you? My favorite singers are Rosa Passos, Leny Andrade, Leila Pinheiro, Rita Lee Esperanza Spalding and local jazz singer James Flynn. And my favourite composers are Tom Jobim, Djavan, Lenine, Steve Wonder and John Mayer. 9) What does the next year have in store for you? I will definitely continue with the concerts and I will start working more intensely on my new original album and tour. 10) What has been the highlight of your career thus far? It is funny how so many small moments can be life changing in an artist’s career. I can guarantee there have been many of those, which were extremely valuable and would be enough subjects for a few long chats. But a few key concerts so far have certainly won a special place in my career as they symbolise that the broader audience has connected with my work: Montreux Jazz Festival 1998, American’s Cup 2002, Auckland Festival 2005, Darling Harbour 2011/2012 performances for over 30.000 people, and more recently, the inaugural Perth International Jazz Festival 2013.